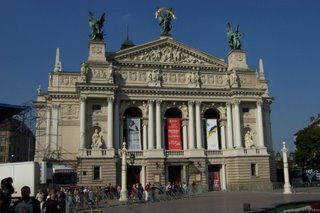 The sky showered bright sunshine out of pure blue as I stood before the world's third most beautiful opera house in L'viv, Ukraine. People lined the broad parkway, talking, laughing, and enjoying the day. Groups of old men clumped around chess players. Pigeons were unnaturally friendly and gathered to peck and bother pedestrians. It looked like a pigeon convention on the square. I think they were practicing their synchronized moves because they would rise slightly from the pavement and fall, move left and right, and turn in military-style precision. Birds, hamming it up for the humans. I almost tossed a few kopeks their way the show was so good. But what can pigeons do with kopeks? 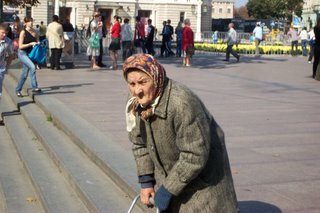 A bent-over babushka pulled her wire cart right into the middle of the pigeons. The pigeons fluttered around her like swarming bees. Pigeons were on her bent back, trying to perch on her arms, hopping around her legs like happy lap dogs. It reminded me of Alfred Hitchcock's The Birds. Babushka started flinging grain from one of her plastic bags. Pigeons nose-dived into the meal. She kept it up until the bag was empty. I swear the pigeons were building cheerleader pyramids, they were so happy. Then babushka started throwing out meat parts; ugly, gooey parts of chicken I think. In the fluttering confusion, I think the pigeons thought it was fillet mignon. Wings were flapping so swiftly passers-by had to lean into the wind to stay upright. I admired babushka. She came, she fed, she left. Amidst younger and better-dressed people, she came and gave pigeons a gourmet meal. L'viv's aviary Mother Teresa. "Your Father in heaven cares... . Are you not much more valuable than they are?" As she walked away, I took her picture. She waved her hand at me and shouted in a most unlady-like, anti-Mother Teresa voice, "@!##*&!! $%#,\.!!" 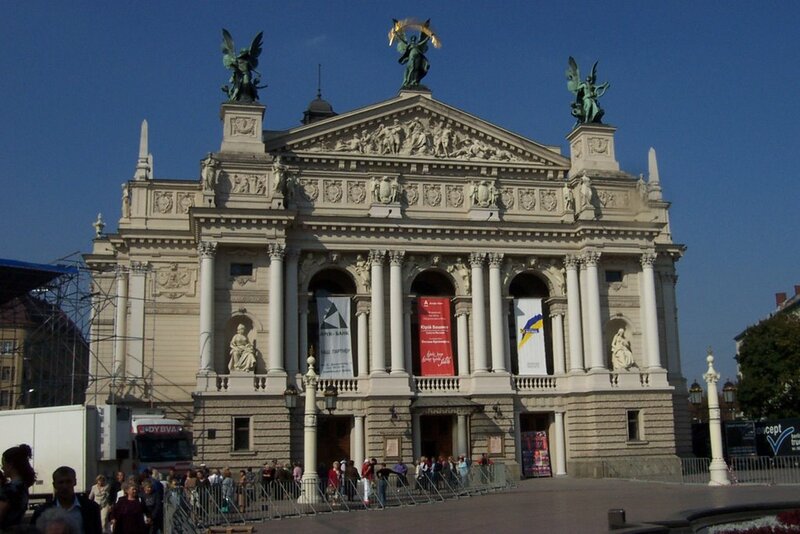 Mercifully for me it was in Ukrainian. I was embarrassed. I heard young people snickering. I think she called me some awfully ugly, gooey things in her native tongue. 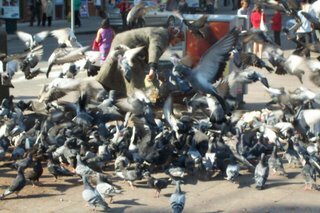 I smiled and put my camera in my pocket and wandered off humming, "His eye is on the pigeons, and I know he watches me." So... do I hear you saying that you will be voting "YES" on Proposal 3 to restore the dove shooting ban? My wife wants me to vote against killing the morning doves. She loves them. We get one once in a while, around our feeder in our front yard. They do have a nice "cooo". Maybe I would anyhow, as I'm not a hunter myself. Maybe I can get her to vote a certain way by using that as a negotiating wedge. Ha. I wouldn't harm a dove. If I vote "NO" to the ban does that mean they drop like flies? WE have doves, too, that wake us with their gentle cooing. Who'd want to murder them? Yes, it was a momentary blessing to be a stupid American who doesn't know the language. I do not have the gift of interpretation. It was a mercy.